Color me surprised: Captain Underpants: The First Epic Movie is a lot of fun and different than you might be imagining, if not familiar with the book series. Kevin Hart and Thomas Middleditch are a great pair, and the voiceover work is largely terrific - helping craft and design characters we care about and connect with. Wonderfully animated, the film's unique look and use of mixed media during the film speaks to the film's cleverness. The "Captain Underpants" books have been rather controversial through the years and even banned in some school libraries and school districts across the country. Obviously, if you have banned your child from reading these books, nothing in this movie is going to dissuade you from changing your mind. Families with kids who are prone to engaging in imitative behavior from the media they consume, will likely see lots of moments recreated at home. If that's a concern, you might want to check the movie out first before your littles see the movie. Right, yeah, look I know...it's a movie about a grown man, who works in a school, as a principal, running around elementary school-age children in a cape and underwear. In real life, he would be arrested and fired from the school district. Here, he's just Mr. Krupp's alter-ego. I know. I get it. It's weird. Repeat after me: You Can't Judge A Book By It's Cover. 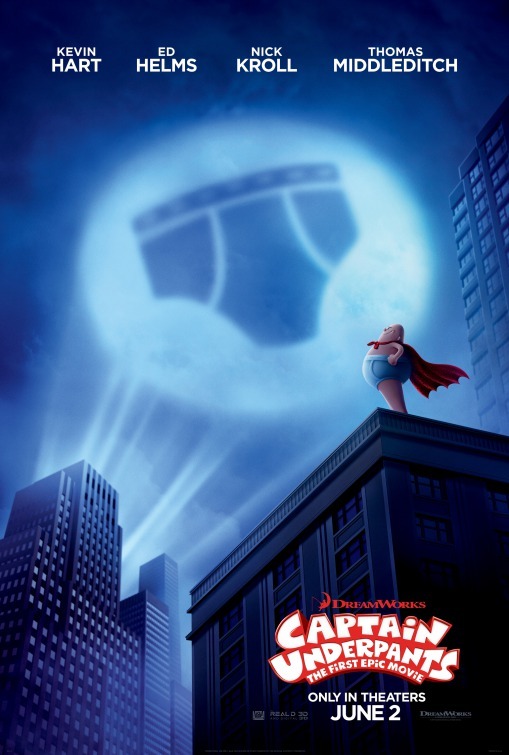 Captain Underpants: The First Epic Movie, at first blush, looked to be a throwaway - a rudimentary, immature, potty-humor tinged animated family film that would likely expend a ton of energy for a cheap laugh or two and provide an addled, hyperkinetic, cinematic experience that rivaled eating an entire bag of Sour Patch Kids and drinking 64 oz. of Mountain Dew. To say my thoughts walking into the film were clouded, would be an understatement. But then my 11-year-old and one of her best friends told me what "Captain Underpants" was actually about. Then a fellow critic and good friend of mine shared more, as did his kids, and suddenly I had no idea what was about to roll out in front of me. For parents and kids alike, the "Captain Underpants" book series by Dav Pilkey is something lots and lots of people are already aware of. Pilkey has generated sales of more than 70 million copies of his 12-book series and it only makes sense that a film studio would come sniffing around to see what could be done regarding a big screen adaptation. Largely sticking to the first book in the series, with elements of Book Two sprinkled in, we meet best friends and 4th grade pranksters, George and Harold (Kevin Hart, Thomas Middleditch), whose ribs and jabs at students and teachers have made their principal, Mr. Krupp (Ed Helms), seething with anger. He has earmarked the kids as essentially an enemy of the school and is desperate to find a way to separate them at school and place them in different classes. When a prank goes awry, and a security cam catches the footage of the boys tampering with a talking toilet, designed by 4th grade genius Melvin (Jordan Peele), Krupp is finally able to end the pranks once and for all and make the switch. Desperate to salvage their friendship and stay in the same class (though they are next-door neighbors and spend every day in George's treehouse...), George trots out a cereal box 3-D Hypno Ring and the boys are able to hypnotize Mr. Krupp into believing he is Captain Underpants - a superhero crime fighter who wears tidy whities and a cape, and serves as the main character in George and Harold's elaborate comic book creations. With a snap of the fingers, the boys learn they can turn Mr. Krupp into his alter-ego anytime they choose, which is fun for awhile, but creates an interesting dilemma: A new science teacher, Professor P (Nick Kroll), has just been hired and the boys are concerned that he may not be exactly who he appears to be. The "Captain Underpants" books are designed for early readers and screenwriter Nicholas Stoller has the rather challenging task of retaining those moments that made the book series so popular for new readers, but also expanding the scope to reach audiences of a different or more mature age. Stoller has some gems and some duds on his resume (The Muppets...yay! Gulliver's Travels...boo! ), but he largely hits strong here, crafting the script around friendship, loyalty, and the importance of having fun while understanding structure and rule-following is also important. And yes, a guy is running around shouting "Tra-la-la!!!" in his underwear and acting crazy, but Stoller and Soren keep things checked and balanced, holding the mayhem manageable and the energy palpable. Hart and Middleditch work great together and the film has a wholly distinctive look and feel, which sets it somewhat apart from the usual animated offerings we get each year. As bright and colorful as anything, the film mostly cruises through it's 89 minutes rather effortlessly, making it a breeze to consume. For all the good on display here, it becomes a bummer when the film loses steam once the Professor P subplot takes hold in the film's middle portion. Perhaps inevitably, this First Epic Movie becomes just another action-laden kids cartoon for a bit, with an over-the-top villain, and that mutes the fun for awhile. What keeps us engaged is the inventiveness of the animation and the terrific work by Hart, Middleditch, and even Helms, who sounds like he's having a blast as the lead character. If only things had been stronger in the second half, Captain Underpants would be a pretty terrific film, as often times it is clever, silly, and something pretty original in scope and presentation. Kids are going to love this, and perhaps, the most surprising element of all is that a large number of grown-up's will experience a lot to laugh at and enjoy here as well. By the mere title alone, DreamWorks and 20th Century Fox are telling us that they want more epic Captain Underpants movies. And quite honestly, based on what we have here - I'm in for a second epic movie. Starring: Kevin Hart, Thomas Middleditch, Ed Helms, Nick Kroll, Jordan Peele, Kristen Schaal, Dee Dee Rescher, Brian Posehn, Mel Rodriguez.